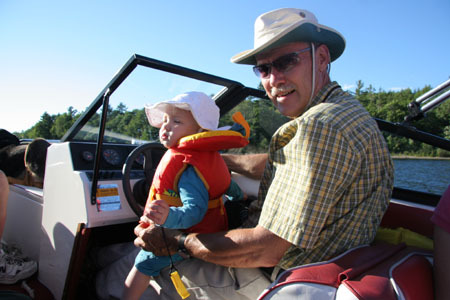 Jerry Callen, shown here with his granddaughter Sophia, is a retired high school math teacher in Guelph, Ontario. He holds a B.Sc. and a M.Sc. Degrees from the University of Guelph. His special interests include cooking, Round Dancing, for which he is the leader and cuer for Harmony Rounds and Melody Rounds, gardening, boating, RVing and genealogy. Jerry is the father of Lillian (Callen) Herceg, Chris, David and Andrew. Jerry and wife Bonnie are round dance teachers and also enjoy ballroom dancing. They teach Phase 3-6 rounds in London and Burlington. In 1996 Jerry developed a new interest in genealogy and published an illustrated genealogy of the Armstrong Family of Eramosa Township, Wellington County. His mother, Esther, was the great-grand-daughter of George Armstrong who settled in the township in 1824.